Arabs regale a mostly ignorant humanity regarding this subject telling them that they, Arabs, are descended from the tribes of Ishmael hence are equal to the Jews (descended from Isaac) concerning the inheritance of the Holy Land. Al Baqara 2:125 “Remember We made the House a place of assembly for men and a place of safety; and take ye the station of Abraham as a place of prayer; and We covenanted with Abraham and Isma’il, that they should sanctify My House for those who compass it round, or use it as a retreat, or bow, or prostrate themselves (therein in prayer). 127 And [remember] when Abraham was raising the foundations of the House and [with him] Ishmael, [saying], “Our Lord, accept [this] from us. Indeed You are the Hearing, the Knowing”. According to Muhammad’s perverted version of the stories of Abraham and Ishmael in his Quran, Abraham (the most ardent monotheist) and Ishmael went to Mecca in Arabia and built a house of idolatry called Kaba. As usual, we shall address this subject based upon the records of both the Bible and Arabian history and not on Islamic wild imaginings and myths. 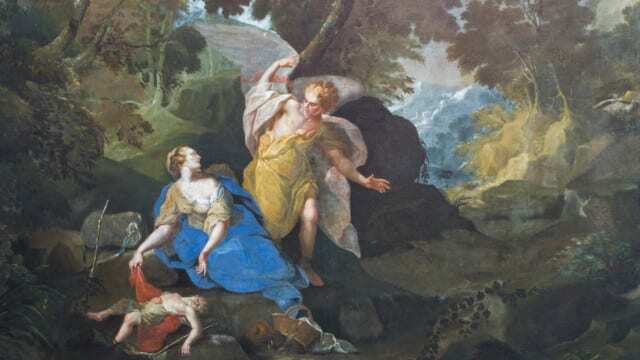 According to the original and ONLY story in the Bible pertaining to Ishmael’s ancestry, Hagar was the mother of Ishmael and the servant of Sarah. Hagar’s name – as the mother of the most illustrious forefather of the Arabs, Ismail – is conspicuously and surprisingly absent from Muhammad’s Quran. It should not be a surprise to anyone who has studied Muhammad’s Quran or read our numerous irrefutable articles about Muhammad, Islam and Muslims that Muhammad and his followers deliberately contorted Biblical stories, unhinged history and twisted facts to suit their warped belief system called Islam. After all, the following extremely important names are also absent from Muhammad’s Quran by the all-knowing Allah: Mecca (as a city), Medina, Jerusalem, Sarah – the wife of Abraham and Eve, the mother of humanity. As we have amply and repeatedly shown in our numerous unchallengeable articles, Muhammad’s Quran is a tossed salad of plagiarized, plundered, pirated and or perverted, precepts, thoughts, concepts and ideas from the Bible, New Testament, Pagan Arabian and Zoroasterian Persian religions, their fetishes, their traditions and their scriptures. Muhammad in his Quran, conveniently and mendaciously, ISLAMIZED all of them pretending they are novel and Newly Created Concepts and Revelations. You should all know by now, based entirely on the evidence of the Islamic sources at hand, that these are pure Fabrications and Lies. Ibn Ishaq, the name of Hagar, the mother of Ishmael is not mentioned at all also. In fact, the name Hagar/Hajar appears only once in the interpretations section of the Quran by Abdullah Yusuf Ali to explain al Baqara 2:158, note 160. According to imaginary and falsified Arab ‘traditions’, Hagar and Ishmael – in this case as a baby and accompanied in their exile to Arabia by Abraham – had their thirst quenched at the well of Zamzam, near Mecca, almost 800 desert miles away from Beer Sheba in Canaan. The Torah – which is after all the ORIGINAL and ONLY source of the story – Hagar and Ishmael found water near Beersheba and not in the desolation of Arabia near Mecca 1400 km away from Beersheba. The alleged Arab traditions – which are of course totally unfounded, unsubstantiated and contrary to the historical and archaeological records – Canaan and Mt Sinai too are in Arabia. 1 – Now Sarai Abram’s wife bore him no children; and she had a maid servant, an Egyptian, whose name was Hagar.2. And Sarai said to Abram, Behold now, the Lord has prevented me from bearing; I beg you, go in to my maid; it may be that I may obtain children by her. And Abram listened to the voice of Sarai.3. And Sarai Abram’s wife took Hagar her maid the Egyptian, after Abram had lived ten years in the land of Canaan, and gave her to her husband Abram to be his wife.4. And he went in to Hagar, and she conceived … And when Sarai dealt harshly with her, she [Hajar] fled from her face.7. And the angel of the Lord found her by a fountain of water in the wilderness, by the fountain in the way to Shur…. 11- And the angel of the Lord said to her, Behold, you are with child, and shall bear a son, and shall call his name Ishmael; because the Lord has heard your affliction ….15. And Hagar bore Abram a son; and Abram called his son’s name, whom Hagar bore, Ishmael.16. And Abram was eighty six years old, when Hagar bore Ishmael to Abram. …8. And the child grew, and was weaned; and Abraham made a great feast the same day that Isaac was weaned.9. And Sarah saw the son of Hagar the Egyptian, whom she had born to Abraham, mocking. 10. And she said to Abraham, Cast out this slave and her son; for the son of this slave shall not be heir with my son, with Isaac.11. And the thing was very grievous in Abraham’s sight because of his son. 12. And God said to Abraham, Let it not be grievous in your sight because of the lad, and because of your slave; in all that Sarah has said to you, listen to her voice; for in Isaac shall your seed be called. 13. And also of the son of the slave will I make a nation, because he is your seed.14. And Abraham rose up early in the morning, and took bread, and a bottle of water, and gave it to Hagar, putting it on her shoulder, and the child, and sent her away; and she departed, and wandered in the wilderness of Beersheba. 15. And the water was spent in the bottle, and she cast the child under one of the shrubs….17. And God heard the voice of the lad….19. And God opened her eyes, and she saw a well of water; and she went, and filled the bottle with water, and gave the lad to drink.20….21. And he (Ishmael) lived in the wilderness of Paran; and his mother took for him a wife from the land of Egypt. Dear readers it is of the utmost importance that you should be aware that before Muhammad’s concocted verses and history, the Pagan Arabs had absolutely no knowledge of Abraham, Sarah, Hagar, Isaac or Ishmael unless they were Christian or Judaized Arabs. 1 Ishmael was born in Canaan near Beersheba to a Hebrew father (Abram) and an Egyptian mother (Hagar). 2 The God of Israel repeatedly asserts in the Bible that ONLY Isaac is deemed the Divinely elect son and NOT Ishmael. 3 ONLY the seed of Isaac was to inherit the Blessing of the Promised Land. 4 Ishmael was a teenager of over 14 years of age when he and his mother were sent away from Abraham’s tribe and NOT the BABY that Muhammad’s Quran falsely claims he was. 5 Ishmael and his mother Hagar, resided thereafter in the ‘wilderness of Paran’, in southern Canaan, and NEVER in the Arabian Peninsula 1400 km away near the Kaba of Mecca. 6 Neither the Kaba, Mecca nor Allah are ever mentioned in the Bible. It therefore stands to reason that, if the god of the pagan Arabs, Allah, was the same as the God of Israel, He would have at the very least mentioned their name somewhere in His Torah. 7 Abraham NEVER visited the Kaba nor Mecca in the Biblical narrative. Ibrahim 14:37 “Our Lord, I have settled some of my descendants in an uncultivated valley near Your sacred House (Kaba), our Lord, that they may establish prayer. So make hearts among the people incline toward them and provide for them from the fruits that they might be grateful. 39 Praise to Allah, who has granted to me in old age Ishmael and Isaac. Indeed, my Lord is the Hearer of supplication. 8 Abraham, Ishmael and Isaac had no knowledge of a god called Allah, a sanctuary called Kaba or a city called Mecca. 9 Abraham, Hagar and the ‘baby’ Ishmael never went to the Kaba or to Mecca according to the original and only biblical story. 10 Since the Torah, as asserted by the Quran itself, was revealed directly to Moses “Kalimu^l Allah” by Allah, and is considered divine, it beggars logic and intellect to believe that Allah – if he were the God of Israel – would have revealed two contradictory versions of the same events. 11 If Ishmael/ Ismail were the elect of Allah instead of Isaac, why were ALL the prophets of the Bible from the seed of Isaac and none from Ishmael’s seed? Narrated Ibn ‘Abbâs [On the authority of the Prophet (See Fath Al-Bari, Vol. 7, Page 210)]. “…(Prophet) Ibrâhîm (Abraham) brought her (Hajar) and her son Ismail (Ishmael) while she used to nurse him at her breast, near the Ka‘bah under a tree on the spot of Zamzam, …..
a) The Jurhum Arabs were in Arabia centuries before the arrival of the Hebrews Abraham and Ishmael and the Egyptian Hagar. b) Ishmael’s original language was Hebrew hence the reason WHY Ishmael had to learn Arabic from the Jurhums and marry one of their daughters. In conclusion, it is self- evident as usual, that Muhammad’s Quran is littered with mendacities of events and stories that are unfounded, untrue, inauthentic and total lies and no follower of Muhammad in the world can, based on ALL the knowledge that is available to everyone, disprove our accusations or proofs. Once again we prove the impossibility that Muhammad’s Quran was ever revealed by any god, not even Allah, since the whole of the Quran emanated from the fertile but warped mind of Muhammad the Pathological liar and deceiver. Once more we prove beyond a shadow of a doubt how Muhammad’s ungodly Quran and Sunna (traditions about Muhammad) literally and invariably Self Destruct as if by Divine Justice.